Spider-Man is back in theaters in this week’s Spider-Man: Homecoming. After an extended cameo in last year’s Captain America: Civil War, this is Tom Holland’s second outing as the web-slinger and his first in the character’s own movie. Well…kind of his own movie. The corporate cooperation that began with Civil War continues here. Sony, which owns the theatrical rights to Spider-Man, is essentially loaning him out to Marvel Studios, which manages the highly successful Marvel Cinematic Universe. So Sony gets to use the successful platform of that behemoth to help launch their third go-around at Spider-Man, while Marvel gets to incorporate Spidey into their big event movies. Continuing the story set up in Civil War, Peter Parker is enamored with the tech genius Tony Stark (played again by Robert Downey Jr.). Stark provides him with a high-tech suit to help Parker fight local neighborhood crime as Spider-Man. The stakes get considerably higher when Spidey crosses paths with, and gets on the wrong side of, The Vulture (Michael Keaton). That conflict threatens everything that Peter holds near and dear and could upend the life he leads as a seemingly unremarkable high school student. Three posters came out at the same time as the second trailer and all three are meant to show off the attitude and style of the new movie. One shows Spidey hanging on a highway sign with directions to the Bronx and Queens, one shows him climbing the outside of Avengers Tower (you can see part of the A) with the rest of the New York skyline in the background, and one shows the hero taking a little break, lounging alongside the river while wearing his school jacket and listening to some tunes, this time with Avengers Tower in the background. The three, taken as a group, not only show the bright visuals of the movie but also keeps up the connection between this and the Marvel Cinematic Universe, which is one of the campaign’s primary goals. Two posters came later on that were subjected to immense internet ridicule. That’s especially true for the one that shows basically everything. Not only are Spider-Man and Peter Parker here but so are Tony Stark, Iron Man, Aunt May, Michelle, Adrian Toomes, Vulture and even Happy Hogan. It’s pretty crowded even without the shots of New York and Washington, DC that establish the setting. There’s no sense of style to this or the other one that strips down the number of people to just Spidey, Iron Man and Vulture. It’s just a collage of stills that have been pasted together to present a “big” movie, though the result is just that it seems overly cluttered. Both of these also play up the presence of Iron Man in the movie, making it seem like it’s an issue of Marvel Team-Up more than a solo Spider-Man movie. 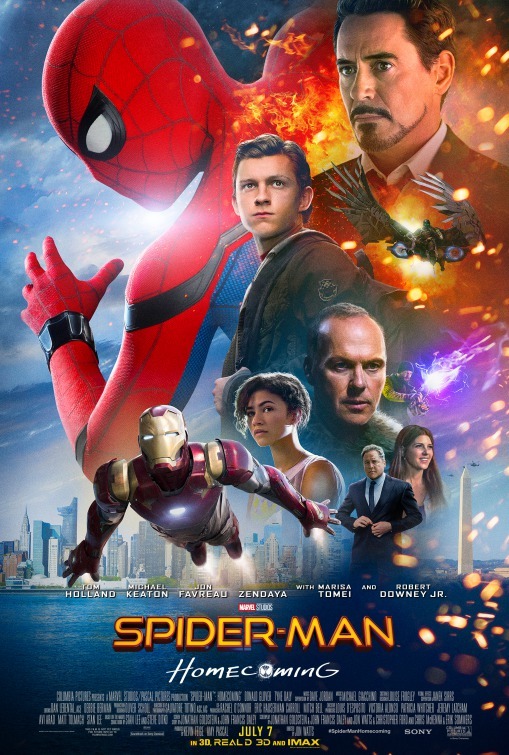 Iron Man is shockingly absent from one poster that has Spidey sitting in-between two buildings looking for his school books in his backpack. But don’t worry, Avengers Tower is still clearly visible in the background, so it’s not forgetting to show us this ties to the MCU. And he reappears on another that shows the two of them moving away from Avengers Tower. Seeming to not heed the feedback that the posters were way too busy and cluttered, one more is all the more busy and cluttered. It’s going for the idea that it looks like a pasted-together scrapbook or something like that, with photos of Iron Man and various other characters spread around here and there, but it still comes off as a bit of a mess. The first trailer works hard to sell the movie as part of the Marvel Cinematic Universe. That actually started with the trailer tease that had Jon Favreau as Happy Hogan talking to Peter, asking if he’d seen “the case” that Stark had sent him with some sort of new suit, though that suit isn’t explicitly seen here. Back to the trailer, it starts with Spidey foiling a robbery by a bunch of crooks wearing Avengers masks. Then we cut to Peter in school, crushing on a girl and being told what a loser he is. Then we see him in a car getting advice from Stark to stay in his comfort zone and that advice will continue throughout the trailer. The footage, though, includes his best friend finding out he’s Spider-Man, some threatening dialogue and footage from The Vulture and, of course, Spidey needing to pull two halves of a bridge that’s been torn apart back together. It ends with Spidey and Iron Man flying through the streets of New York together. I’m legit not sure how I feel about this spot. The Peter Parker moments work really well and the Spider-Man bits are good, but it actually feels like the heavy involvement by Tony Stark weighs things down a bit. It’s too much to put on this trailer and while the studio is clearly trying to bring the cache of the Marvel Cinematic Universe to the Spider-Man franchise, it also means the story can’t stand on its own. It’s also incredibly likely that this is 85% of Stark’s presence in the entire movie. The second trailer is much more action-packed and linear in terms of showing the story. There’s still the interplay between Parker and Stark, including the latter’s warnings to the former that he know the limits of his capabilities. A lot of the friendship between Peter and his classmate is on display but eventually, things ramp up as Vulture attacks a car ferry. When Stark helps him out it leads to a dressing down by the Avenger but Peter won’t be cowed and continues to go after Toomis on his own, despite the threats from the bad guy that he’s putting everyone he loves at risk. There are the same comments I could make and issues to take with this version that there were with the first. It does show off the actual story a bit more coherently but comes dangerously close to highlighting every story beat and leaving nothing to be discovered by the audience. It works, though, and Holland is given a bit more of a spotlight. Plus, bonus points for showing off more of Keaton’s apparent scenery chewing approach to his performance. The third official trailer is all about the suit, showing just how advanced it is thanks to Stark. It brings together a couple different themes from the marketing to this point, not just the way he’s seen as too young to play with the big superhero boys but also the threat he faces from Vulture. Most importantly, it shows us our first look at Donald Glover, though only briefly. The first thing that comes up when you load the official website isn’t the trailer or anything like that. No, it’s a map that shows where the movie is playing near you that offers the ability to buy tickets immediately. This takes the usual “Buy Tickets” prompt that’s commonly used a step further and makes it clear the studio has conversions, not just awareness, as its primary marketing goal. Close that there is a more traditional “Get Tickets” button in the top left. Opposite that on the right are links to the movie’s Facebook, Instagram, and Twitter profiles. There’s also the reminder that #SpiderManHomecoming is the movie’s officially-sanctioned hashtag on social channels. Finally, there’s a button that will take you to the VR experience that’s been developed by Oculus, for which a trailer released that promised to take the viewer inside the suit for a first-hand experience as Spidey. Turning our attention to the content menu on the left, the first section there is “Videos” which begins playing the third trailer. The “Synopsis” follows and offers an alright overview of the story. There are about a dozen stills in the “Gallery” for you to flip through. “Cast and Crew” just offers the names of those involved in the making of the movie. The companies who are helping to promote the movie are listed, along with details of those partnerships, in the “Partners” section. Finally, there’s another link to the VR Experience and then a prompt to download the official movie app, which offers all sorts of exclusive content like photo filters, stickers, material that looks like what you’d find on Peter’s personal phone and more. 8i created Spider-Man holograms that could be added to the videos shot using the app. A TV spot that aired during the NBA Finals is mostly concerned with showing Tony Stark, who winds up inviting Peter to his house to watch the game. It’s…it’s not great. There were, in fact, a whole series of spots during the Finals that followed Peter as he tries to get back to Stark’s viewing party. More TV commercials followed that kept up the connection to the MCU while also selling this as a Spider-Man solo movie. Pizza Hut, which offered branded packaging and ran co-branded TV spots to promote the movie and their pizza. Audi, which got Holland to reprise his role as Parker in a long-form commercial that sees him taking his driving test. The company also had a major presence at the movie’s red-carpet premiere, with A8s on display. Dell, which launched a whole campaign titled “Superpower meets Super Powered” to tie its latest gaming laptop to the movie. That campaign included an interactive game involving a Times Square billboard and a TV spot that was also used in pre-show theatrical packages. Dave and Buster’s, which featured a new movie-themed game in its locations. General Mills, which worked with Blippar to create a new augmented reality experience tied to boxes of select snacks and products. That was backed up by TV spots. Synchrony, which launched the “Save Like a Hero” campaign featuring Spidey that involved interactive quizzes and a poster giveaway. Goodwill, which used the movie launch a “#HeroStyle” campaign encouraging people to come in and make their own outfits, supporting the organization’s cause while doing so. Goodwill also provided the supplies for the Spider-Man DIY influencer campaign where a handful of YouTube stars were asked to put together their own Spider-Man costumes. Panasonic, which created a contest inviting people to upload a photo of themselves and then “catch” their friends in a web, increasing their chances to win a trip to New York. Not sure if it was an official partnership – it probably wasn’t – but Spidey dropped in on patrons of a New York City Starbucks to surprise them. PlayStation offered the full version of Peter Parker’s vlog, seen briefly in some of the teasers for the first trailer. That’s the video Peter shot of getting the suit from Stark along with his chronicle of the airport fight between the two Avengers factions seen in Civil War. Outside of the casting of Holland and various conversations focused on Captain America: Civil War, the title of the movie was finally officially announced at a CinemaCon presentation. Later on, at San Diego Comic-Con 2016 concept art was revealed, characters were confirmed, footage shown in Hall H and more. Set photos continued to either leak or be officially released and the cast, mostly Holland, were asked about it at every occasion, even when they were promoting other movies. There was a nice bit of publicity came in THR’s “Next Gen” issue, where Holland was interviewed about getting and preparing for the role and he and Zendaya talked about the movie and what audiences can expect. Just before the first trailer came out a first look official photo was released along with comments from Marvel’s Kevin Feige and others about the movie’s story, cast and more. Similarly, right before the second trailer, there was a reveal of better looks at Keaton’s villain character along with comments from both him and the costume designer who talked about Vulture’s armor. Shortly after that, there were comments from Holland about advice he got from Keaton about playing a superhero and from one of the movie’s producers about how high-tech Spider-Man’s costume actually is. Further stories would explain how Spidey fits into the larger Marvel Universe he’s suddenly part of and details on the Stark-driven technology of the new suit. A full clip, glimpsed in the trailer, of Peter’s friend discovering his secret identity debuted during the MTV Movie and TV Awards. The movie was also one of the big franchise features that weren’t in competition but nonetheless got big, flashy stunts and promotions at the Cannes Film Festival. Holland made the press rounds, of course, even appearing at times with Downey Jr., a reminder to fans that this was being sold as a team-up movie even more than a solo Spider-Man story. He did do some solo appearances as well, particularly closer to release. Zendaya’s role in the movie remained largely a mystery but she got in on the press action too, including this profile that talked about her career so far, only tangentially talking about Spider-Man. She talked more here about her character specifically along with topics like diversity in comic movie characters. Of course there continued to be stories about the crossed cinematic and corporate universes in play here, including this one about the bet Sony is placing. In short, they’re hoping the short term issues caused by ceding much of the control to Marvel Studios is seen as being worth the long-term gain for Sony and the character. One more big push just before release came with an Entertainment Weekly cover story that included comments from Holland, Keaton and the rest of those involved. There was also a feature on director Jon Watts, who talked about how his indie films opened the doors of Marvel to him and how he prepared for taking on a character like Spider-Man. Oh, what to make of this campaign. As much as I want to be buoyed by the youthful enthusiasm Holland brings to his portrayal of Parker/Spider-Man, I can’t help but feel it’s unnecessarily weighted down. The need – likely contractual – to shoehorn Tony Stark/Iron Man into every available nook and cranny of the marketing feels overly burdensome. Regardless of what the deal between Sony and Marvel actually is, it comes off like Sony doesn’t believe enough in the character or the execution of this particular movie to let it stand on its own. Stark keeps appearing to prop things up, to remind the audience that this is now taking place in the MCU. I know that’s the goal, to make Spider-Man part of the larger cinematic world, but with Downey Jr. seeming to get as much screen time in the trailers as Holland and taking up a fair amount of poster real estate, it comes off as overkill. It’s the “how do you do, fellow kids” of movie marketing campaigns tactics. Aside from that, the visuals of the posters and corresponding website feel cluttered and over-thought. Every possible story element is crammed together as if it were not just assembled by committee (as opposed to one or two people with a strong artistic sense of design) but by a committee that was beholden to a larger committee with a substantial checklist of items to include. There’s something to be said for how the branding is there to simply create and reinforce awareness, but that is happening in spite of, not with the help of, the visuals that are shown throughout the campaign. In the end, the best marketing for Spider-Man: Homecoming may have been the ~15 minutes Spidey swung into Captain America: Civil War. That means this installment is trading on a lot of goodwill the inevitable sequel, along with the planned Venom spinoff, won’t have in its favor.